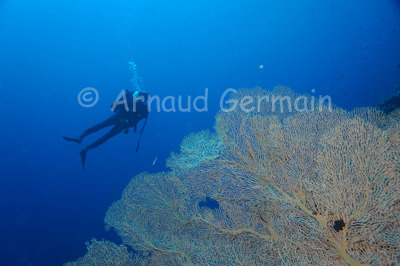 On this particular dive, we wanted to dive the Northern plateau of Elphinstone Reef to try and spot hammerhead sharks. The current was way too strong so we opted for the East drop-off instead. We descended on this drop-off and managed to get close to some huge sea fans that usually we see under us at the end of the dive. I wanted a diver in the background in the blue to show the size of these sea fans. Elphinstone Reef, East Drop Off, about 35 metres down, Marsa Alam, Egypt.